Facebook Messenger is increasing transparency and at the same time making it harder to ignore someone's text message without the other person knowing. The social network is rolling out some new features for the service. Now you can see if someone has read your text message and it's easier to tell if someone is typing and where they're located. The "read receipts" also work for group messaging and display the names of the people who've seen the message directly under a sent message. The updates will show up first in the standalone Messenger apps for iOS and Android, and then appear in Facebook's main mobile apps and its website, reports TechCrunch. Messenger is a service that allows users to send messages containing text, pictures, and location data to their Facebook friends and groups between cell phones. It is a form of text messaging, but also akin to instant messaging because messages can be longer than the typical text message that is pushed to your handset by your mobile carrier. Also, unlike more traditional text messaging, Messenger allows you to have more seamless conversations. If you're not familiar with Messenger you might wonder why you'd need a messaging app in addition to the official Facebook app. Yet you can use Facebook Messenger to quickly and easily send time and location stamped messages to groups of your Facebook friends. Another great feature is this: When you use it on your phone Messenger logs your chats inside Facebook so if you move over to the Web interface your conversations are right there. You can send new photos, ones you've saved on your phone, or images you find using Bing search. 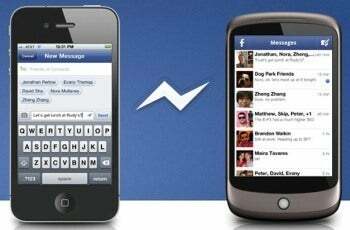 Even people who don't use smartphones can reply to messages just by confirming their mobile phone number to activate Facebook texts. One thing is certain -- Facebook is serious about improving its mobile offerings; its $1 billion purchase of Instagram underscores that point. It also just acquired the location-based discovery app Glancee, which before Facebook closed it and hired its founders let people find strangers in the real world who share their Facebook friends and interests.